Hi everyone, well it’s been a LONG time since I’ve posted, but now that school’s out, let the blogging commence! Anyway, I recently acquired a vintage reflector from a really nice guy, a Criterion RV-6 Dynascope. I read up on these, and they apparently were top of the line back in the day (1950’s to the late 1970’s). 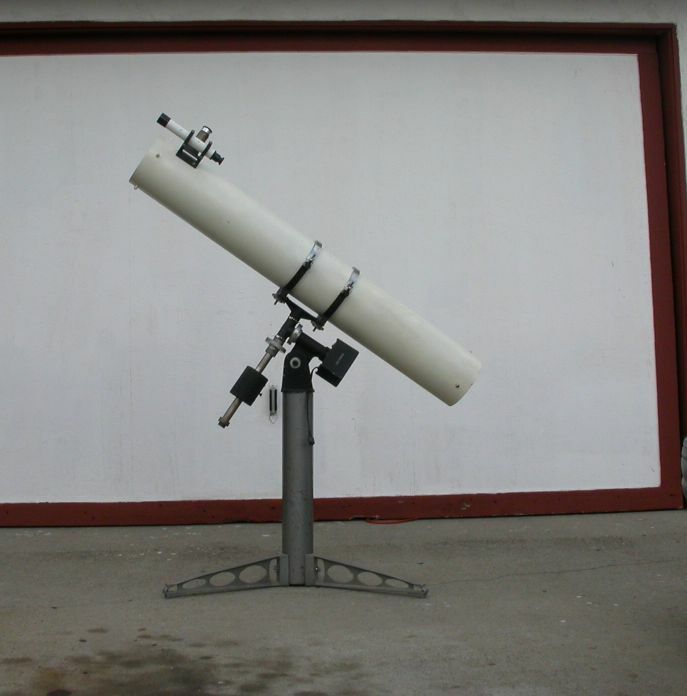 The RV-6 is a 6 inch F-8 Newtonian Reflector on an equatorial mount with a plug in motor drive for star tracking. Top of the line back in the day, before the company’s demise with the rising popularity in the late 70’s. So this is my summer project, restoration of this beautiful telescope. I took it out for first light a few weeks ago, just as is (after of course cleaning the mirror as it was very dirty with all sorts of material I didn’t know what it was). I got it roughly polar aligned. The motor drive plugs into a standard outlet, and functions very well for it’s age (at this time, I did not know the precise date of this particular telescope). The view? Phenomenal. My first target was Saturn, and plainly showed 4 moons, and this was not a very clear night. Banding on the planet was obvious, as well as detail in Saturn’s rings. Very pleasing, refractor-like images and sharpness. Collimating well is the key to better views in even cheap telescopes, but when you collimate well with a scope like this, it’s awesome. My next target was M13, the famous sparkling globular in Hercules. Now remember, where I live, there is very severe light pollution, and pulling detail out of deep sky objects, even bright ones is a challenge. But, having good eyes has helped, I’ve pulled M81 and M82 out of my Observer 70mm from here in La Verne, which is quite an accomplishment I’ve heard. Some people struggle with acquiring this in a 6 inch scope, but a 70mm? Wow. Where were we? Yes! M13 with the RV-6. My Orion Expanse 15mm eyepiece yields about 80x in this scope, and the view was spectacular. Very bright, round, on the verge of some resolution even at such a power as low as 80 (which is rather low for observing DSO’s. Averting my vision in various directions will make the glob “grow” and brighten, and make it very grainy. The most satisfying part of the view was that it wasn’t moving! I’m sure I’ll discover that when seated (this scope’s designed to have the user remain seated) and tracking, I’ll pull out much more detail. Mating the barlow lens with the 15mm yields about 160x. Now it was getting interesting. With direct vision, the glob took up about 1/6 of the field. Averted and direct showed numerous faint member coming out of the backround. When it’s averted, the glob gets huge! So there you have it, my first light of the classic RV-6 Dynascope. So, before I got into it, I knew I should make a scheduled plan of what to do and how to do it. I made an immediate decision to refurbish the OTA before the mount, which would simplify things right from the start. First off, the condition the tube is in needed a lot of cosmetic help, meaning paint and hardware. Some tape had been put on the tube as a marker to show where to put on the tube rings for balance. Well, they were stuck on there good, I don’t know what kind of tape it was, but I pulled off a good amount of it, and sanded the rest down. I had already decided to give the scope a brand new paint job, so I used the existing paint as a sort of primer, and sanded it really smooth. 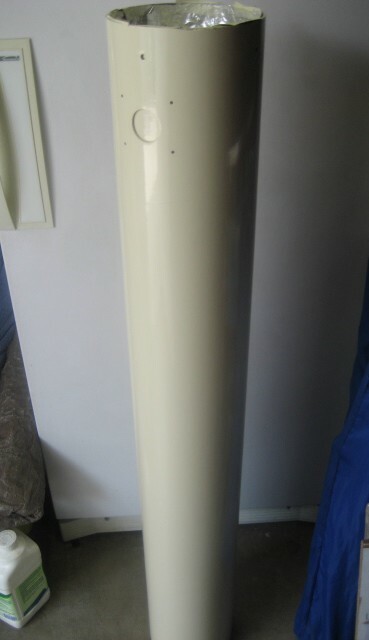 The tube is a kind of cardboard, called bakelite back when it was first invented. All in good condition, except for a small piece scraped off at the edge of the top of the tube. For the paint, I did not want a bright glossy white, but rather I chose a glossy (not original) Vintage White color, from Rustoleum. Took 2 cans to do, and also will be needing a clear-coat as a finish. So right now with that, I’m making sure the white is completely dry for the last coat. I also painted the 6x30mm finderscope in the same color as the tube, and it looks great, but, the side of the tube is engraved with “Criterion”, and it might prove difficult to repaint this back to black. If things continue going at this pace, expect to see a completely refurbished, put back together, working RV-6 by hopefully the beginning of July. I think the tube will be finished rather soon as there really isn’t much to do there, just cleaning, and minor paint touch-ups here and there, nothing big, but I think it’ll look awesome when this project is done, and also, a great scope to use!